The Stevie B Show 4th April 2019 - The one that almost got away! Welcome to the Mixcloud page of CHBN Radio. 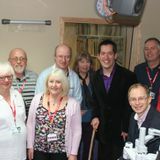 CHBN provides a community radio service for Truro, Cornwall, and the surrounding area and a hospital radio service to patients in the Royal Cornwall, West Cornwall & St Michael&apos;s Hospitals. We offer a wide range of music and speech programmes for all ages presented by our dedicated volunteers, often highlighting health and lifestyle issues and always playing a wide range of music with general and specialist appeal. We aim to provide a platform for the community we serve to promote their messages to the population of Truro and its surrounding areas - clubs, bands, musicians (old and new), youth organisations, businesses, schools and colleges have all featured on air.